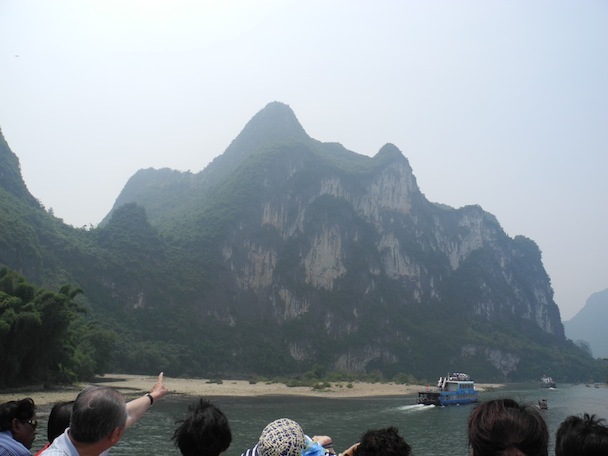 We spent Monday morning on a boat cruise down the Li River starting a Guilin and ending at Yangshuo. 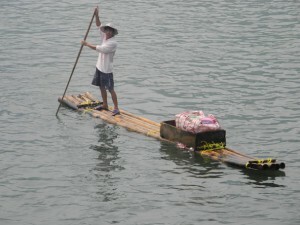 It was beautiful scenery of the karst hills, local boats and water buffalo, but the constant haze diminished the view. The boat had three levels including an open air roof to take in the view. Along the route, weathered locals in 3 foot wide bamboo rafts would pull up alongside and attach to our boat briedly to sell lychees and greengage. Or fake jade and straw hats. Of one the hills along the river is known as the Painted Hill of Nine Horses. The exposed variegated limestone on the hill is said to contain the outline of nine different horses at various places on its precipice for those with a keen eye. I think I maybe saw two if squinted; clearly I have no imagination. For those keeping track, I had Li Jiang beer along with my lunch on the boat. It’s not that I love beer, but the chances are better that you’ll be served more than 4 ounces of a liquid with your meal if you choose beer. And end point of the cruise they handed out fans for each one of us, which seemed odd because the dining area was air conditioned. Only when I got off a marketplace in Yangshuo did I appreciate the gesture. It was hot. Up the street market, our group stopped at a shop that sold beautiful Miao crafts and jewerly. And perhaps more importantly, had an air conditioner running at full blast in the back. 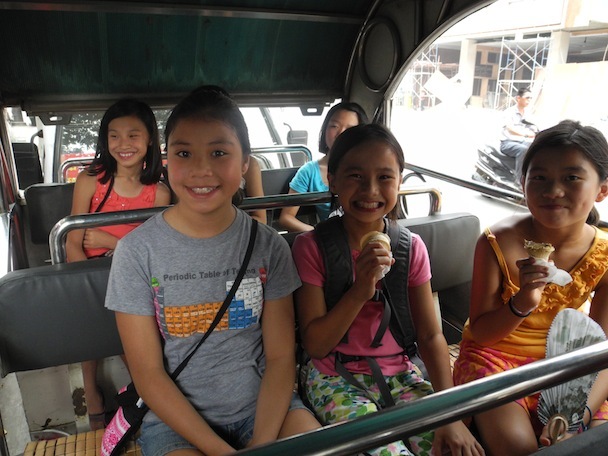 I bought some semi-gelato-esque ice cream for my daughters just up the street and most of the group joined them shortly afterward before heading into town for a “golf cart” tour of the local area. 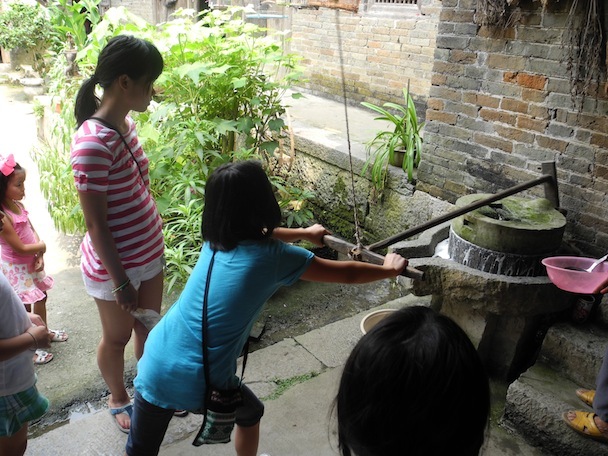 We stopped at a rice paddy and an historical 340-year-old house. Beans and peppercorns were drying in the open area between the mud room where there were a few birds in cages. The girls pumped water from the house’s well and ground soybeans in an old stone press. The house had a pair of open, painted caskets in one of the dark rooms. The lady of house, who did not speak English, made a sleeping gesture with her hands aside her face to indicate what the long, hollow wooden item was (which was pretty obvious). Then she pointed to an elderly man in the front of the house indicating that he was eventually going to be its occupant.